Today's ink is Robert Oster Green Olive. From the name I was expecting a green ink, but it's actually an interesting yellow. I purchased my sample of ink from Vanness Pens. Green Olive ranges from a bright to medium yellow. When concentrated, there was a little bit of black that showed up around the edges. On 20 pound copy paper the ink behaved well, no issues that I noticed. 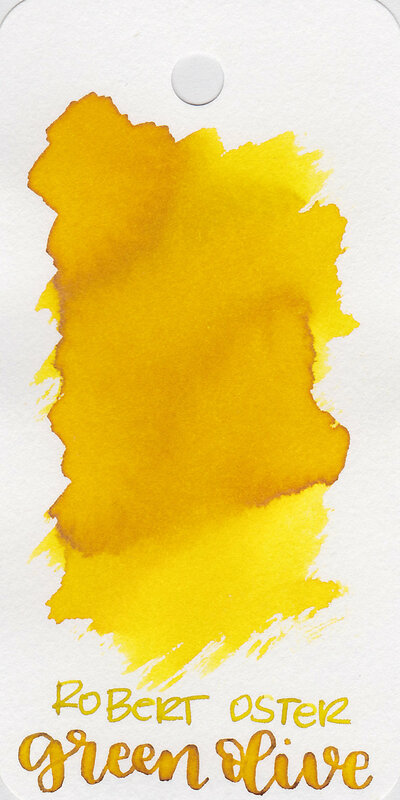 Ink swabs for comparison, left to right (top to bottom for mobile RSS): Robert Oster Aussie Gold, Robert Oster Green Olive, and Robert Oster Yellow Sunset. Click here to see the Robert Oster inks together. Click here to see the yellow inks together. Aussie Gold seems like a darker version of Green Olive. I used an extra-fine mint Kaweco Sport on Tomoe River paper. The ink had an average flow. Then I switched to a Pelikan 400N. Overall, it's an interesting yellow ink. It's darker in the smaller nib sizes than I expected. Give it a try, you might love it.